For anyone outside of New Jersey (or anyone inside that’s never heard of it) Emery’s was that little slice of heaven in New Egypt, NJ that we hit on our way home from the shore. I blame it for my sweet tooth. It was a “u-pick-em” type of establishment for blueberries and had a lot of fresh fruit goods. I have never liked blueberries (who knows why, it makes me an anti-New Jerseyian so I hear…and here I was thinking it was the lack of a spray tan…) so we always got to pick two pies when we went. My sister and father usually picked blueberry or coconut custard (another thing I’m not a fan of) and my brother, mother, and I would decide on the other one. 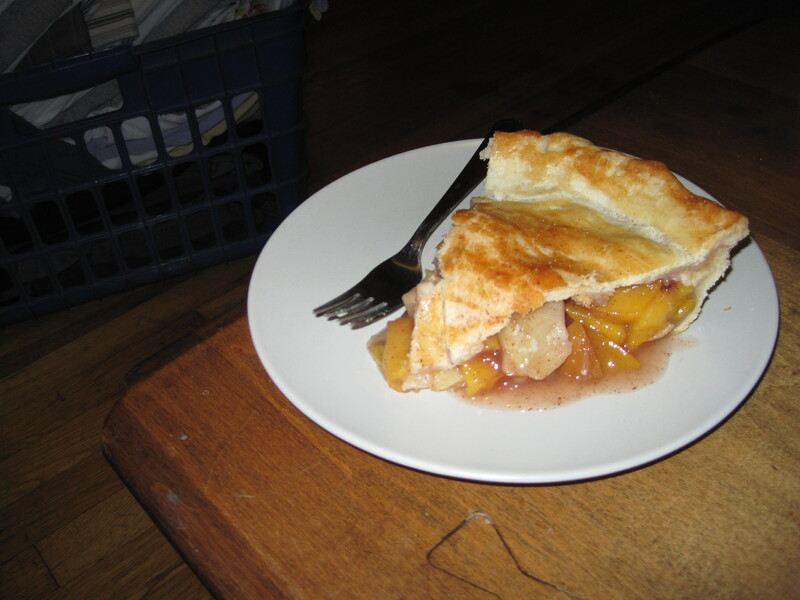 When I won, it was the Apple Peach Pie cause hand to God it was that freaking awesome. So, on this cool, blustery fall day I walk into our local grocery store and see apples and peaches and I’m immediately reminded of my little slice of heaven. Given point (1) and the fact that my parents were coming to town this weekend I decided to whip together Jen’s Apple-Peach Pie. I do believe everyone wins. Preheat oven to 400 degrees F. To prep, peel, slice, and core apples and peaches. Soaking them in water with a tablespoon of lemon juice will prevent the first apples cut from turning a funky color. In a medium sized mixing bowl, mix together sugar, flour, cinnamon, salt, vinegar, and nutmeg. Drain apples, add peaches, and add then add both to the dry mixture. Line pie pan with one of your two pie crusts. Add apple and peach mix to the pie spreading out evenly. Lay second pie crust on top. To make design around edge of pie use the back end of a butter knife along the edge of the pie pan. 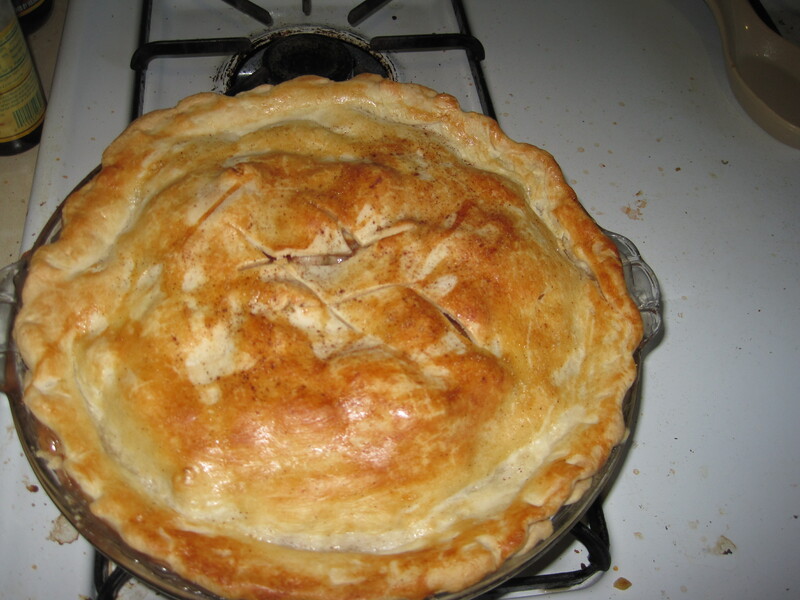 Cut long strips of tinfoil and place them around the edge of the pie. This prevents the crust’s edge from burning while it bakes. Bake pie for 40-50 minutes at 400 degrees F. Brush with a small portion of egg white on top of the crust when you remove the tinfoil for a glossy effect. Remove tinfoil and cook for an additional 10 minutes. Let cool and dig in!